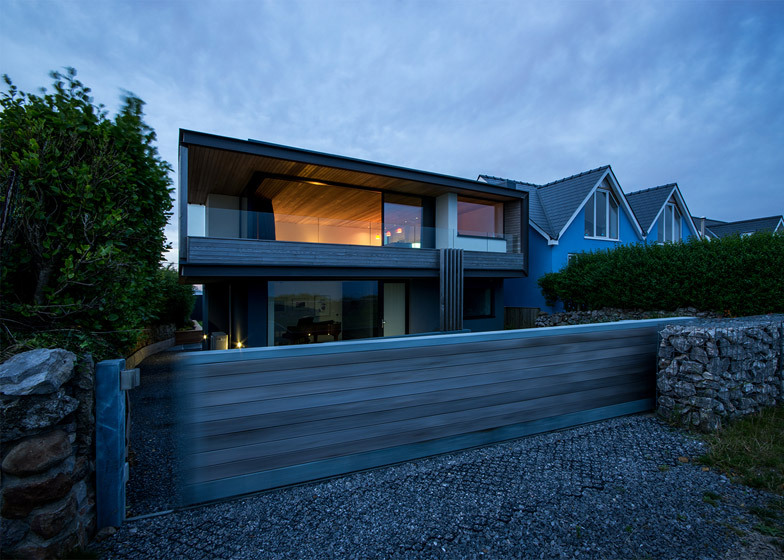 A cedar-clad balcony spans the facade of this house designed by Hyde + Hyde, which is perched on the edge of cliff on the southern Welsh shoreline (+ slideshow). 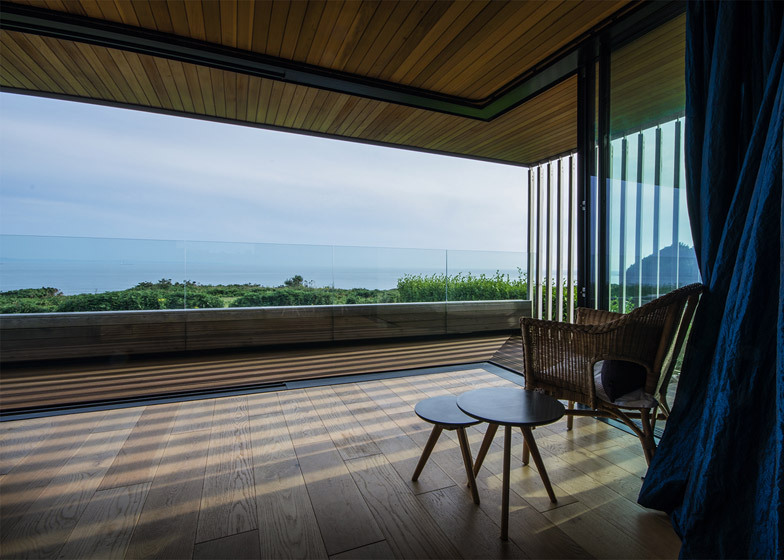 Welsh studio Hyde + Hyde designed Cliff House to make the most of the coastal scenery, from a vantage point overlooking the sea where the Bristol Channel meets the Atlantic Ocean. To this end, the architects turned the traditional house layout upside-down, moving the living room onto the first floor so that it can benefit from the elevated views. A dining room and kitchen runs along the rear and side of the space, allowing a large balcony to stretch around the south and west elevations, behind floor-to-ceiling glazing that slides open. 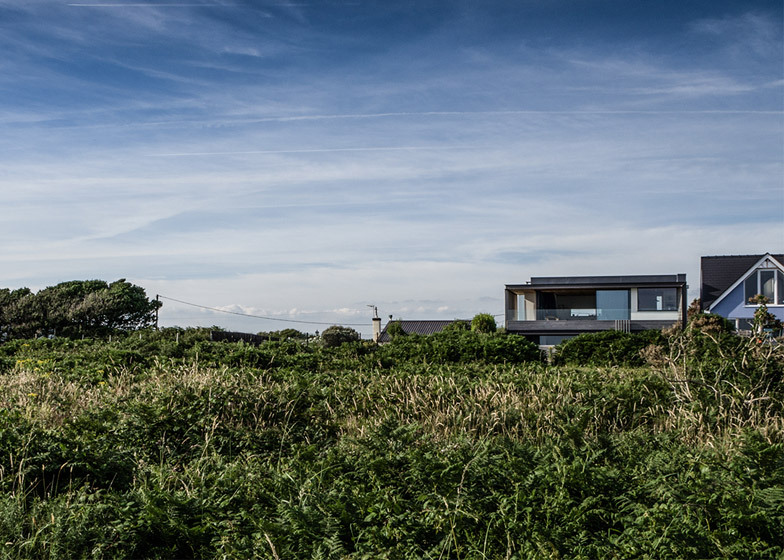 "Ascending into the kitchen and living room on the first floor to a sweeping view of the south Wales coastline is the culmination of your journey through the house," architect Kay Hyde told Dezeen. "The ever-changing light and atmospheric conditions offered by the ocean contribute to an ethereal and relaxing environment." Insulated concrete formwork was used to give the residence a robust, energy-efficient structure. 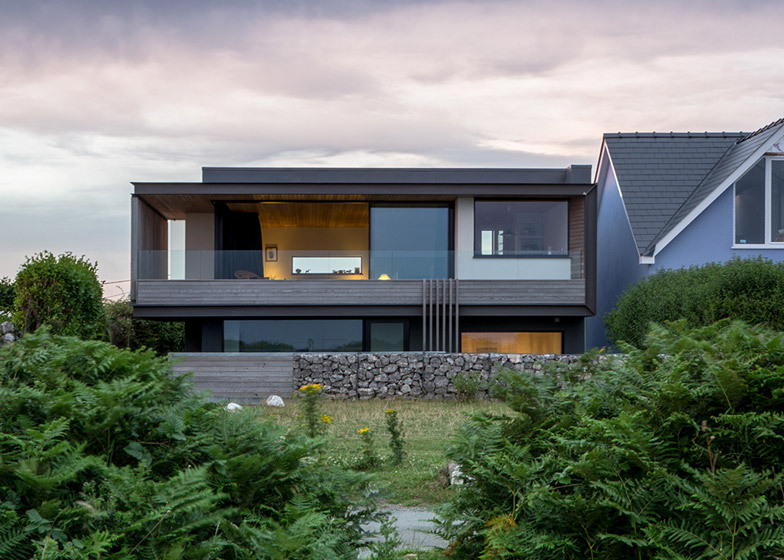 Elevations are finished in a muted grey render, contrasting with the cedar planks that clad the protruding volume of the balcony to "balance the heaviness". 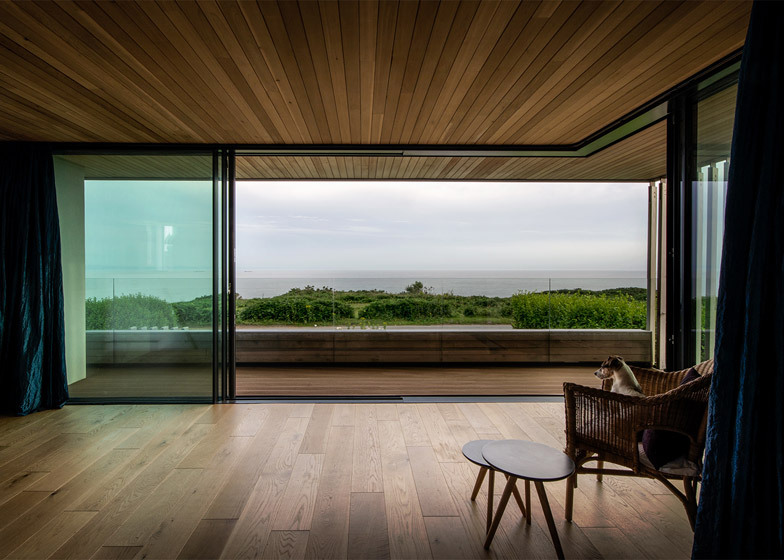 "Cedar was an obvious choice for its natural resistance to the maritime climate and also to introduce an element of domesticity and warmth to the project," said Hyde. 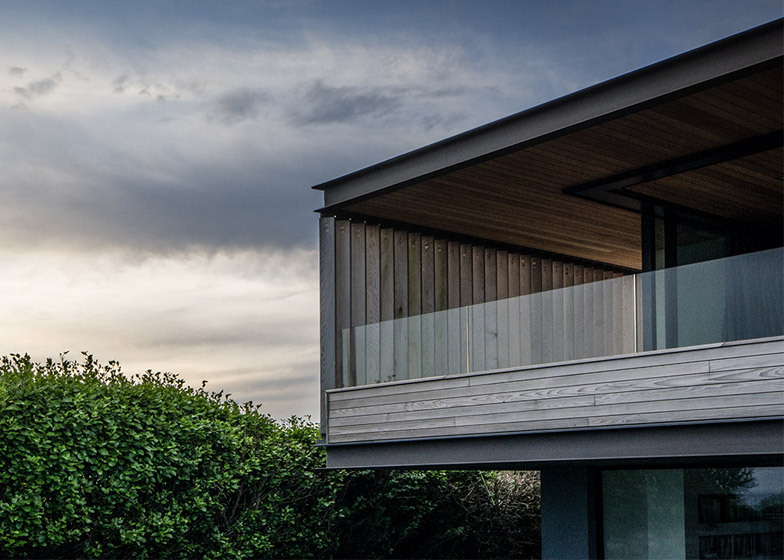 Angled louvres offer protection from the prevailing south-westerly winds, and also offer some privacy for residents, while a glazed front balustrade allows continuous views. The entrance to the house is also positioned along the sea-facing southern elevation, so both this and a car parking space are sheltered beneath the balcony. The ground floor of the house is organised around a simple corridor that divides the space up into three areas. To the left is a music room – where residents can sit down at a piano – and a bedroom. The two rooms to the right include a private study and a bathroom, while a master bedroom with an en suite and large dressing room are tucked away at the rear. An air-sourced heat pump provides energy for heating, which is distributed through the interior via an underfloor heating system. Solar panels on the roof supplement this by creating a heat source for water. "Elements of the design ensure that the building's long term energy performance will be exceptional," added the architects. The site is bounded by an existing stone wall, to which the architects have added a new wooden gate. Photography is by David Schnabel.